Many people enjoy really decking the halls during the Christmas season. However, making a bathroom take on the spirit of Christmas is not always easy, which is why having a choice of Christmas shower curtains can help you turn that ordinary bathroom into a bright and attractive salute to this special holiday. The Curtain Shop is a retail store that opened its doors in 1976 in New Rochelle, New York. This company has built its reputation on the quality of their products and service, and by offering a great selection of curtains to meet every need. The Curtain Shop’s holiday shower curtains are one of the largest selections around, which why all of the products in this review are offered by this company. A great way to bring the Christmas spirit alive in your bathroom décor is the Up On The Rooftop Shower Curtain as this shower curtain has just the right features to bask this utilitarian room in the warm glow of Christmas. The Up On The Rooftop Shower Curtain features a cute Santa all decked out for Christmas. This shower curtain has bright and bold colors, and is sure to become the focal point of bathroom décor. With the dark blue background, white snow flakes, red dressed Santa, and green toy bag, matching your linens to this shower curtain will be breeze and will give your bathroom a simple and fun holiday look. Reviews for the Up On The Housetop Shower Curtain are good, with most customers finding this shower curtain a fun addition to their holiday decorations. Overall, this is a very popular shower curtain for the Christmas season and would be a wonderful addition to any bathroom. 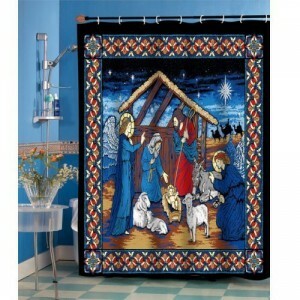 The Three Kings Polyester Fabric Holiday Shower Curtain is a wonderful and colorful way to decorate your bathroom for the holidays while gently reminding people of the true meaning of Christmas. The Three Kings Polyester Fabric Holiday Shower Curtain is perfect for people who want to add a touch of Christmas to their bathroom. This shower curtain has varying shades of red which will really brighten up any bathroom with an explosion of color. However, co-ordinating bath linens may be a bit difficult due the shades of red that are used in this curtain. Your best bet may be to use white towels tied with red ribbon. Reviews for the Three King Polyester Fabric Holiday Shower Curtain are good. This shower curtain is eye catching and customers were really happy with it. The Gift Boxes Christmas Ensemble Shower Curtain is a perfect holiday shower curtain for those people looking for a more sophisticated and chic way to decorate their bathroom for the holidays. The Gift Boxes Christmas Ensemble is a colourful, yet elegant, shower curtain that is sure to bring your bathroom alive. There are so many colors in this shower curtain that co-ordinating your bathroom linens with this shower curtain will be simple and easy. Add a red or green candle or soap dish and your bathroom will glow with Christmas cheer. For a touch of class in your bathroom, this beautiful shower curtain is well worth considering. The Silent Night Polyester Fabric Holiday Shower Curtain is almost too lovely to be used to deck out a bathroom. This shower curtain is absolutely beautiful, and just looking at it brings on a peaceful feeling. The colors are rather dark, so this shower curtain would look best in a lighter colored bathroom. Reviews for the Silent Night Shower Curtain are exceptional. Interestingly enough, customer find this shower curtain too beautiful to simply grace their bathroom. One customer uses this curtain at a French door, and another plans on trimming the curtain to make a hanging quilt.